I spotted a crew with string trimmers and blowers about to drive out on the course. I flagged them down and they were nice enough to offer up their empty seat. This was lucky, because the walk from the maintenance facility to the nearest hole (No. 10) is already a long haul… these guys told me they were headed to No. 4, just about the farthest point on the golf course. I asked the guys what they were about to do, and Erin Hills intern Drew Monogue said, “We’ve got to take out some areas of damaged rough.” I nodded and sat back, enjoying the VIP ride across the course. When we pulled up to our destination, I realized this was an “all hands on deck” project. Crews were arriving from multiple directions. Darin Bevard, the USGA’s director of championship agronomy, was there waiting. Then Erin Hills Superintendent Zach Reineking rolled up on a Jacobsen HR600 rotary mower, like a Bruce Lee movie where the villain with the baddest weapon shows up last. The crew got busy and fescue started flying. Reineking on the street howitzer, six guys on Toro rotary push-mowers, a dozen guys with rakes, another six guys on blowers, even one guy nicknamed “Big Cat” wearing double blowers. It was, in a word, a spectacle. I was documenting the whole scene with both my phone and my “good camera” while posting the entire scene to Twitter (sorry, I’m not really down with Facebook). I posted a few videos as well. I wasn’t the only one. Practice rounds had begun, so golfers walked by and craned their necks, trying to understand what was happening. A couple caddies took photos. Curtis Strange walked by and recorded the action. I looked around and saw that golf fans also were watching. Keep in mind that PGA Tour player Kevin Na had posted a video the day before blasting the rough at Erin Hills. Up until a blimp caught fire and exploded near the course (seriously), the rough at Erin Hills was the biggest story before play began. In case you’re wondering, I don’t think the USGA was caving to Kevin Na’s (or anyone’s) complaints. I think they were fixing what they saw as a potential problem, based on severe weather. Frankly, the decision to chop down a couple areas of rough shouldn’t occupy that much consideration with golf fans. 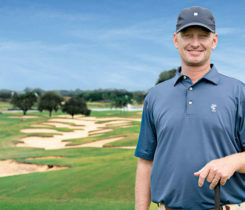 But it’s interesting that the course itself gets so much attention — it was arguably the biggest star of this U.S. Open. In other words, I feel like more people know the name Erin Hills right now than Brooks Koepka. Golfers and golf fans around the world are interested in how these courses are maintained, in how they achieve the look that they do. And that’s good for our business.